We will be celebrating our annual Ann Miner Memorial SOUPER BOWL. 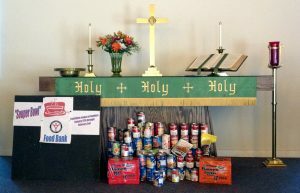 Please bring canned soups to the service beginning on January 20th and concluding on February 3rd. We'll build our annual “tall tower” of canned soups in remembrance of Ann's outreach work. The soups will be contributed LOV’s Emergency Food Pantry on February 4th.